Everything new in iOS 12.1 beta 1: Group FaceTime returns! 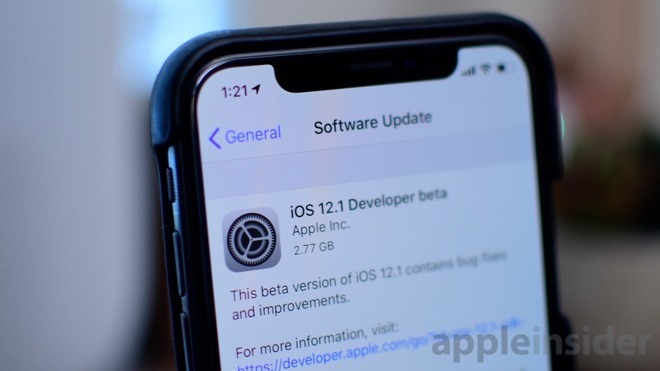 The first developer beta of iOS 12.1 has been seeded to developers. AppleInsider takes the plunge to discover any new features or changes buried within. We first ran the initial beta through back to back Geekbench tests. The scores were a bit below the last tests we ran on the official iOS 12 GM, but this is no cause for alarm. As a first beta, performance won't be critical as changes are made and will likely return to normal levels as we reach the public release. For what it's worth, we haven't noticed any actual slowdowns in real-world usage. Most importantly in this beta, we are seeing the return of Group FaceTime. This was removed early on in the iOS 12 development cycle and Apple has quickly brought it back. Apple seeded iOS 12.1 beta 1 alongside watchOS 5.1 and tvOS 12.1 just a day after the public release of iOS 12, watchOS 5, and tvOS 12.